Last night I attended my first meeting of the Pomona Valley Amateur Astronomers, who, you’ll recall, were kind enough to invite me along on their Mt Wilson trip a few weeks ago. The evening’s feature presentation was on the Juno mission to Jupiter, which is under construction right now. Juno is slated to launch in two years and arrive at Jupiter in 2016 for a year-long observing run. Unlike the Mars rovers, which can be run until they quit, probes to the Jupiter system are deliberately crashed into Jupiter while they’re still functional. This is to avoid having a probe break down, crash land on Europa, and contaminate it with terrestrial microbes. It was a great talk and I was feeling jovial–and Jovian–when I got home, so I hauled out my 6-inch reflector to have a look at Jupiter. The atmosphere was fairly clear and steady so I got out my camera. My method–holding the camera by hand up to the eyepiece–is called afocal projection photography by photographers and opticians, digiscoping by birders, and white trash astrophotography by me. My camera is an older model, a 4MP Nikon Coolpix 4500 , but it has good optical zoom and it is a favorite for this sort of thing among birders. If you want all the nitty-gritty, I put the camera in macro (flower) mode, manually set the exposure, zoom to the desired level, let the camera autofocus on the target, and snap away. I usually take between 50 and 100 pictures. This gives me a good sample from which to pick the one or two best shots afterward. Sometimes my hand moves, sometimes the autofocus gets squirrelly. The biggest thing, though, is that atmospheric turbulence varies moment by moment. Even on a night when the sky is roiling there may be short windows of stillness, and vice versa, so it pays to take a lot of pictures in hopes of hitting the jackpot. Many people now are using webcams, which shoot continuously, and then choosing only the sharpest images to stack and process. I haven’t ascended to that level yet. Last night turned out to be exceptional, at least during the brief interval around midnight when I was out shooting. 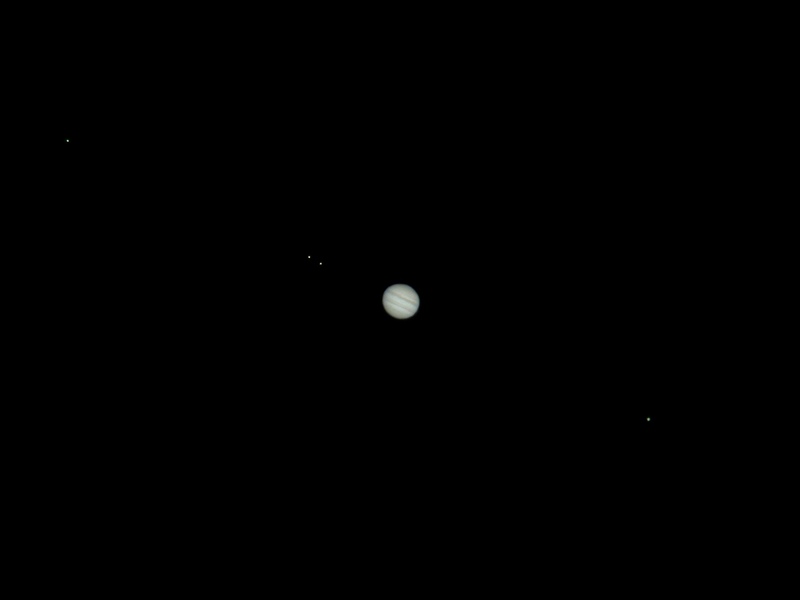 I got the sharpest pictures of the full moon and of Jupiter that I’ve ever taken, and the first I’ve ever gotten of Jupiter with all four Galilean moons. 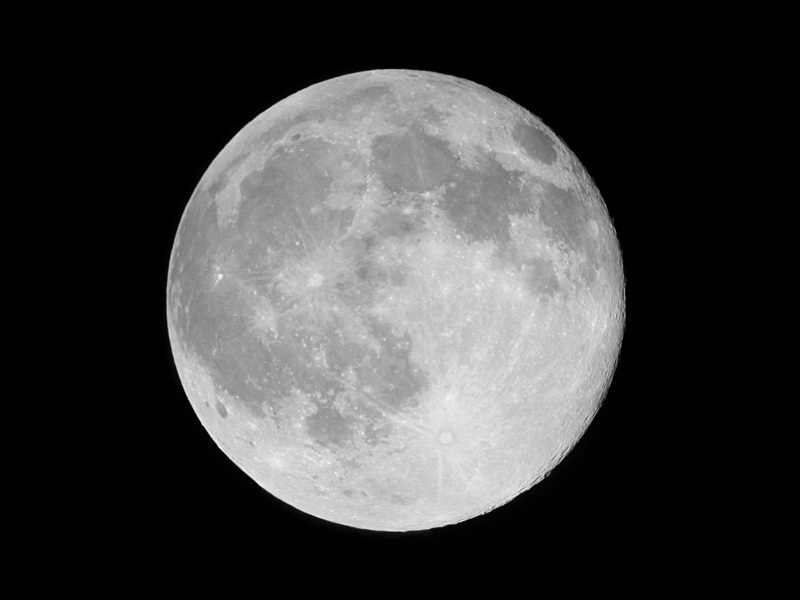 Click the picture below for the full size, unlabelled version (moon IDs from Stellarium). Clear skies! You are currently browsing the 10 Minute Astronomy blog archives for the day Saturday, September 5th, 2009.